Quote from Coach Melton of Americas High School that, I think, hit the nail on the head. Most schools nationwide have lost sight of that simple truth. Too many schools have become testing factories that only care about the bottom line of meeting standardized testing benchmarks and have sacrificed anything that doesn’t work towards improving government mandated statistical benchmarks. The ancient Greeks believed the three sides of the education triangle included academic, spiritual and physical, and that a man was incomplete without all three. Coaches everywhere understand this, but in Texas, coaches have the political clout to fight the slide toward athletic mediocrity that has largely gutted many other public school systems. So far, public support and the power of the THSCA have generally been successful in resisting state efforts to sacrifice athletics, but every coach I’ve talked to is worried about the general attitude the state government has towards public education. Here’s hoping Texans understand they have something special in its high school football and don’t let the politicians gut it. I crossed into Texas yesterday and sat down with Pat Melton at Americas High School and this morning with Scott Brooks at Canutillo High School. Both coaches took unsuccessful programs and have had some success in turning them around. And both, I felt, were realistic about the obstacles faced by teams in the far west part of the state. They are just so isolated out here. Coaches who bounce around from job to job in the rest of the state rarely take jobs out here and conversely local coaches don’t have an incentive to venture out once they’ve climbed the El Paso coaching ladder. Both Brooks and Melton said there were some great players in the region but agreed the demographics of El Paso make it tough to compete with other parts of the state. -It’s clear this area doesn’t budget athletics at the same level as the rest of the state. The facilities are outstanding compared to most of the country, but not up to the standard of the rest of the state. -While the teams from the far west struggle in the state playoffs, they still benefit from the same athletic policies that make Texas football so outstanding. On campus coaches who all teach year round athletic periods. I believe this is the most important factor in the quality of Texas football and it is a situation that is largely unique to Texas. In most states, assistant coaches are often off campus volunteers and even when they do teach, they usually have little day to day contact with the team during the off season. -This hiring and staffing policy means Texas teams are going to be generally better coached than teams elsewhere. -Maybe coming from the desert west myself, I’m a little biased, but I find this area prettier than I expected. I had a nice little hike today to the top of the Wyler Aerial Tramway. 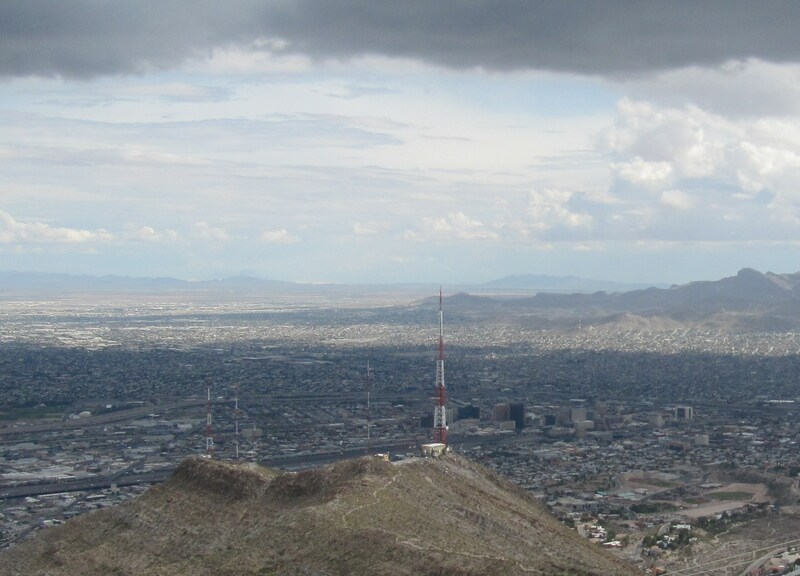 Great views of El Paso and Cuidad Juarez. Going to be a while until I see another mountain. -Tomorrow, I’m headed towards San Antonio for the THSCA clinic, coaching school and all-star game. I understand there are usually 15,000 coaches in attendance. 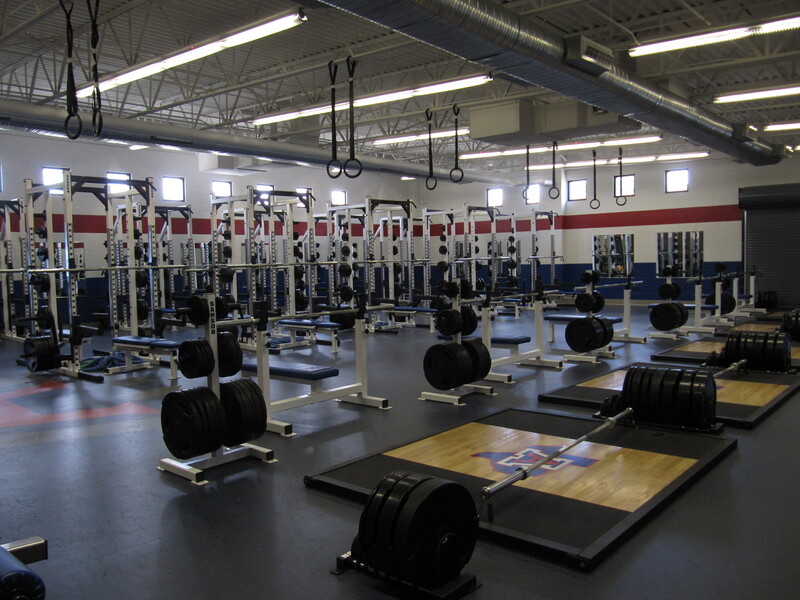 New Weight room at Americas, just finished this year. From the top of the mountain,,,looking at downtown El Paso and across the river into Mexico. Here’s something to keep in mind as you come to Texas. The salient feature in Texas geography/demography is the Triangle. Take the three largest metro areas in the state — Houston, Dallas-Ft Worth, San Antonio — and connect them with straight lines. The area within that space contains 60% of the state’s population, 80% of its wealth, and almost all of its growth. Consider the following: 1) Texas has 254 counties ; 2) Texas is the fastest growing state, and yet, 3) about half the counties in the state lost population between 2000 and 2010. What’s happening here? Well, for all the counties slowly bleeding population there are towns in Texas just exploding with new growth. Towns you probably have not heard of — places like Boerne, Pflugerville, Katy, Allen, Round Rock, Wylie, Tomball, Sugar Land — have grown by at least a factor of ten in the last twenty years. How does this tie into football? At the 4A and 5A level almost all of your champions come from inside the Triangle. The high growth areas attract people who self select into competitive high schools. These schools have more kids, more resources, and better coaching than you’ll find outside the Triangle. The coaches from El Paso, Corpus Christi, the Panhandle and other locales outside The Triangle may have all kinds of theories as to why they’re not competitive but, in the end, it comes down to demographics. Here’s another feature in Texas geography not found on a map. Draw a line from Corpus Christi to Laredo. Everything south of that line is considered the Rio Grande Valley or, more often, just … The Valley. Outsiders may refer to this area as South Texas but here in Texas it’s just The Valley. Now the Valley is overwhelmingly Hispanic and unbelievably passionate about their football. During the playoffs if a Valley team makes it to the third round legions of their fans will make the 200 mile trek to San Antonio. And, though its been over 50 years since its happened, if and when a Valley team wins state the region will just go bonkers. Harlingen came pretty close last year and it will be huge if they make it farther this year. Finally, as for me, I live here in Port Lavaca, the epicenter of Sandcrab Nation. Describing what all that entails will take its own post at a later date. So, for now, Welcome to Texas. Great post. Interesting point about the demographic shift in the state and something to talk to people about when I’m outside the “triangle”. 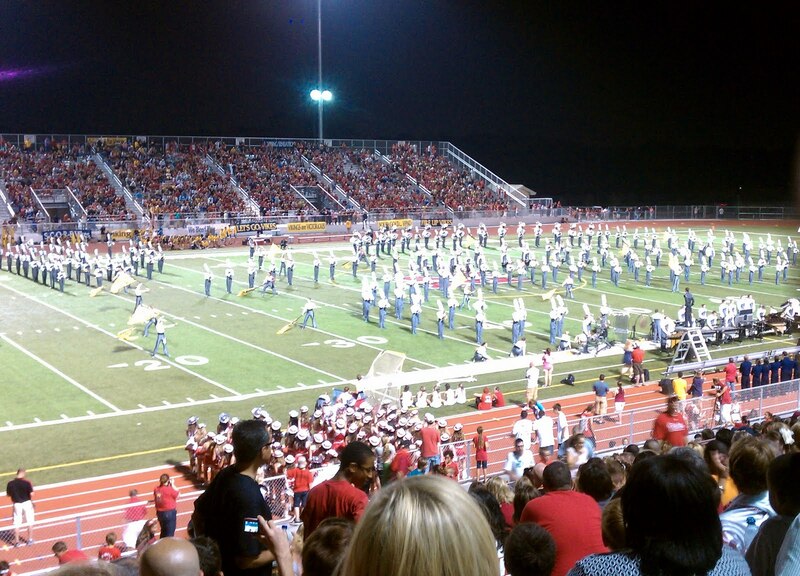 I watched a You-Tube video of that third round game with Harlingen last year and the atmosphere looked just amazing. I knew my project wouldn’t be complete without a visit to The Valley and I’m really looking forward to my week in Harlingen. Port Lavaca also was highly recommended to me. I ‘ll be there for homecoming week and I look forward to your description as a citizen of Sandcrab Nation. My last few days at home for a long time. I’m heading to El Paso on Tuesday, then to San Antonio for the THSCA clinic and all star game at the Alamodome. 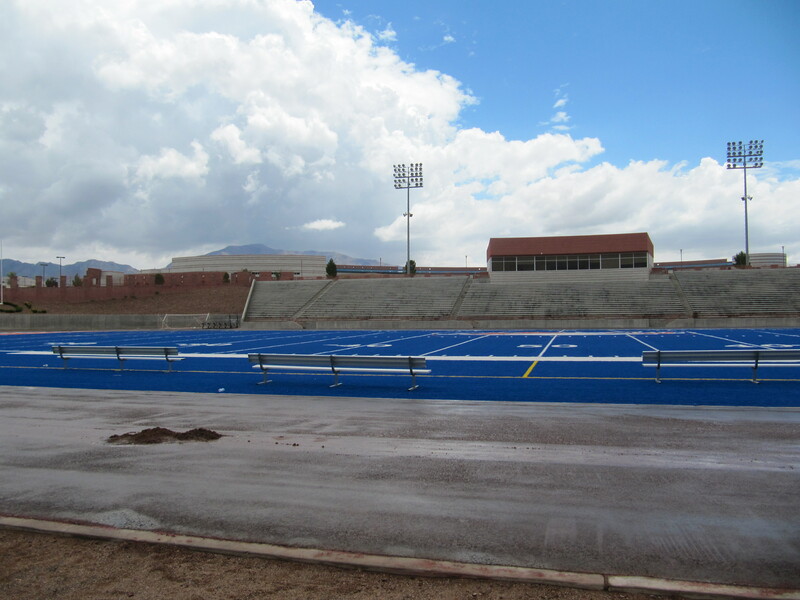 I will be meeting with several El Paso coaches next week about the condition of football in that city. I know their teams haven’t had a lot of success statewide, so it will be interesting to get some insight into what causes the disparity between the far west and the rest of the state.